Even with a Masters in Ed. Tech I count on the digital natives to set up my phone. They’re not smarter than us, they are just more intuitive when it comes to technology because they were born with it. Your husband’s flip phone saga reminded me of when I was checking my email at a college cafe recently. “You’ve got mail” proclaimed my Netbook loudly. Heads turned, some laughter, and then one kid said a bit condescendingly, “I haven’t heard that since I was five.” I’ve had my AOL account for 20 years; it may not be trendy, but it has allowed me to stay in touch with all of my former students (some of whom may have been in your husband’s meeting). BTW if you want to really impress your kids, try Animoto.com (you can make 30 second clips for free and it is very muddle mom friendly). Oh that kid’s comment is hilarious! My kids make me feel really old when it comes to technology. I can still remember trying to figure out the Internet in college. I didn’t know there was a back button on the browser so I’d write down every web address. Just trying to find my way back to my original page took forever. I couldn’t even begin to grasp email but when I did, it was so much fun! You sound like me! I hope someday my kids do grow up to manage my blog, wouldn’t that be great? I had a hard time just putting widgets in my sidebar. I still can’t figure out how to add a twitter button properly (and I still don’t tweet anything more than my blog posts) I do try to keep up with technology…but honestly I get tired of all of it and just want to give up. I don’t like Twitter. I can’t understand why anyone cares about most of the stuff on there. I’m sure that shows my age. It took me a long time to figure out widgets too. My husband did all of that for me and I have since added a few things myself, but honestly, I’m afraid to touch it when he’s not home. Who knows what would happen. Twitter was so crazy and confusing to me until I downloaded tweetdeck and made a column for each list of people I follow. Now I can tell who is talk to whom! I already feel like an old lady because all my friends have smart phones now and smart phones are conversation killers… unless you want to converse with Siri. I get real cranky about it. You lost me at tweetdeck. It’s an app made by Twitter so that you can actually use Twitter. I was annoyed that I had to download it. Why didn’t they just make Twitter better instead? Your post makes me smile. I know the secret delight to not getting in with the whole smart phone, Twitter, know everything right-this-second trend that is becoming the norm anymore. It’s called a LIFE. My husband and I still use flip phones. The real benefit? My bill is only $30/mo for two phones (we talk to each other for free), never mind that it is not a constant. He’s a higher-up at his company and attends a lot of meetings. He plunks his useless phone-only-unit (not even texting is enabled) on the table with all the smart phones, proudly, shamelessly. He has something that many of his other co-workers do not — a life outside of work. Yeah, I only use Twitter for blog stuff, but when I read it then, I’m pretty clueless. I’m certain there are people on there all day. I don’t even have my TV during the day most of the time. We stayed with our pay-as-you-go plan because we literally put money into our account and use maybe $20 every few months. There’s no monthly fee. For now we’re grandfathered in because I don’t think the plan exists anymore. So when my phone dies, it’s back to a monthly bill. My kids learn PowerPoint at school and will eventually be able to do some really nice presentations with it. They’ll have to teach me how to do all of that. I’ve had instances where I could have used it with freelance-related things and didn’t know how. even at 16 i still have a hassle keeping up with technology,everything gets outdated once they’re sold its almost ironic really. That’s so people will keep spending money on the latest gadgets. Another reason I have my trustworthy flip phone and pay-as-you-go plan! Thanks for stopping by! I could’ve written this. It took me years to take on a cell phone — I worked for a politician who wanted to have access to me and my coworker all hours of the day and all week long. It was so liberating to be able to tell him that I didn’t have a cell phone so, no, I didn’t get his call while I was out at the restaurant. 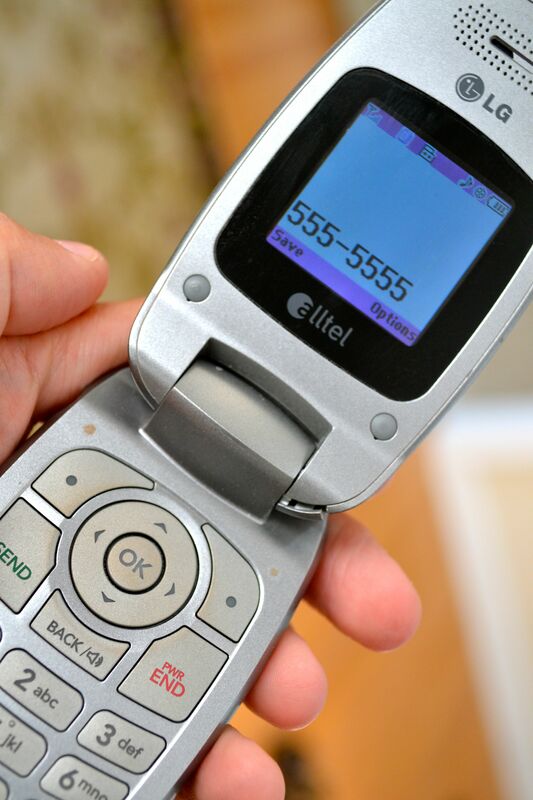 When I got pregnant with my daughter, I knew I’d want a cell phone for emergencies. I have a prepaid one and I’m pretty sure your flip one is a couple years ahead of my model. I remember a friend had the exact model I currently have — in 1999. Not joking here. My husband’s work now covers his tech stuff, including an iPhone. He got so hooked that he bought me an iPad for Christmas. I dig it. And it’s helped me ease in to the Apple world. Once you learn one Apple product, the rest make more sense. But I’m still not caving on the smart phone. My kids will have one before I do. Oh, and they are only 2 1/2 and 5 and can easily work the Netflix streaming. Not good. I have left the room for 10 minutes and returned to find them watching a vampire movie. Fortunately they hadn’t made it through the opening credits. Yes, I have an Apple computer and there is no turning back there. Of course, I don’t know how to use everything on it, but still. I love the line “I am resourceful even when I’m challenged.” I am too and I’m convinced that will get us through anything! Tweeting has been a new adventure for me and I’m intimidated most of the time. I’m actually looking forward to my kids knowing more than I do about technology – they can teach me (my husband is less techie than I am and that’s not saying much). My kids leading the way will save lots of money on tech consultants in the long run! Great post! One day they will be hooking up and fixing all of my gadgets, just hopefully not until I’m done trying to stay one step ahead of them and doing what I need to do as a parent. If they know more than me, I’m in trouble! But true, hadn’t thought about the savings! As long as there is a gap! I feel like if I don’t even try to keep up, I lose too much ground. This stuff moves fast. Thankfully, I can rely on my husband who’s a tech geek to beat the kiddies down but as for Twitter – the silliest invention ever.